Great news for Lightroom users who both own iPads and love the Java runtime: The Mosaic app can now do two-way sync with Lightroom on your Mac, letting you load photos onto your computer and then sit down in your favorite easy chair with a cup of coffee to rate and reject your pictures using the iPad. I tried the Mosaic app some time ago, when it was primarily a way to view your Lightroom library on your iPad, via the web. Your photos are hosted by Mosaic, similar to how apps like Everpix and Picturelife work, and are kept in sync with all your latest Lightroom edits. For Lightroom users, it’s a pretty neat service, costing just $7 per month for the basic tier (unlimited previews, no storage). Now it’s even neater, with two-way sync of Lightroom stars and flags. That is, you can now rate pictures and set pick and reject flags on the iPad and the changes are synced back to your Mac. It’s like PhotoSmith, only without the tedious import/export process. The only problem, and the only reason I didn’t install the 80+MB download (a PKG!) is that it’s a Java app. I don’t have a Java runtime on any of the Macs I use, nor will I since Apple stopped including it due to security troubles. But the main reason I don’t like Java is because the apps are just plain ugly. Still, a near 100MB package is a little too big for my SSD-based MacBook Air, so I can’t tell you how well this works. Which is a shame. 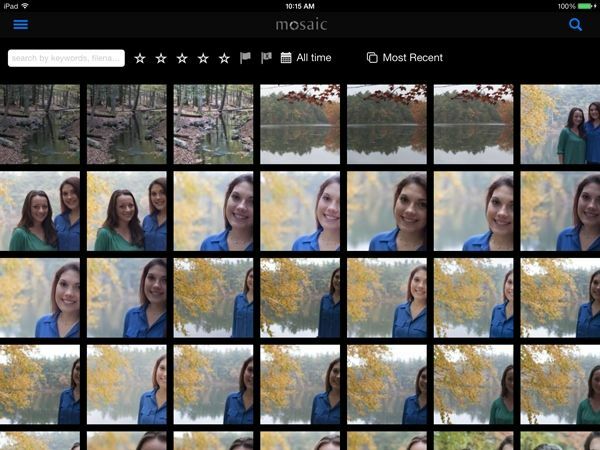 Mosaic is free, with IAPs for anything over 2,000 photos.